Two dozen or more types of leafy greens are grown in New York, primarily for fresh market production. According to the 2007 Census of Agriculture, 224 New York farms produced 1,398 acres of lettuce. Leaf lettuce is the most widely grown with 758 acres, followed by 381 acres of head lettuce and 260 acres of romaine lettuce. Lettuce is grown for local sales as well as large wholesale markets in the Northeastern, US. Other popular greens are spinach (247 acres), collards (96 acres), escarole & endive (75 acres), kale (57 acres), mustard greens (36 acres) and turnip greens (16 acres). Additional types for which no statistical information is available include: arugula, beet greens, bok choy, dandelion greens, radiccho, rapini, swiss chard and watercress. Field-grown greens are available beginning from May through mid-October (depending on the type). However, the season can be extended by growing in tunnels protected from harsh winter temperatures. This year's lettuce variety trial was conducted at Pleasant Valley Farm in Argyle, NY. It was planted on May 28th, and harvested August 1st. The main goal of the trial was to evaluate romaine varieties to see which would perform well in hot summer conditions and there were 17 days above 85 degrees. The CCE Eastern NY Commercial Horticulture Program evaluated 20 lettuce varieties in 2017. The outdoor production trial was conducted in Washington County, hosted by Pleasant Valley Farm. 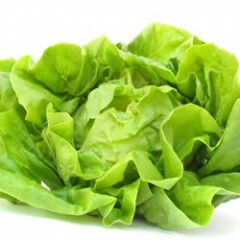 The lettuce was rated on disease susceptibility, taste, bitterness, and weight of one head.